Newport County midfielder Mark Byrne is in talks to extend his contract at the League Two club. Byrne, 25, joined on a free transfer from Barnet in July and signed a deal which expires in January 2015. But Exiles manager Justin Edinburgh is confident an extension until the end of the season will be sorted soon. "We want to conclude the deal and I think that will be done in days rather than weeks," Edinburgh said. "I don't foresee it being a problem. "I've spoken to the directors and the chairman of the club and I spoke with Mark and he's more than happy. "His performances and levels of performances have been outstanding." 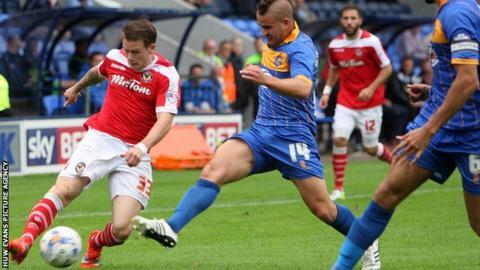 The Irishman, who has made 12 appearances for County this season, began his professional career in England with Nottingham Forest. He spent loan spells at Burton Albion and Rushden and Diamonds, where he played under Edinburgh before joining Barnet in 2011, where he spent three years. Byrne and Andy Sandell are available following suspension for Saturday's League Two game at Dagenham & Redbridge. But midfielder Robbie Willmott is out of at least the next two games with a foot injury with the club awaiting the results of a scan. Meanwhile goalkeeper Jamie Stephens is to join Gloucester City on loan subject to international clearance.